People might have different religions, characters, forms, and facilities, but the feelings of mankind could not be diverse. History and the modern period of Poetry prove that the World needs the words created by heart to be developed yet! 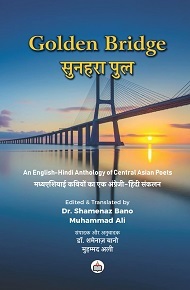 “Golden Bridge” provides you with the unique thoughts, different styles and emotional inspirations of Central Asian creative thinkers and at the same time, you would definitely find out that how the senses could create the magic. The magic that comes skillfully from a soul to the soul, the magic comes impartially from mind to mind and the magic comes faithfully from a pen to the paper. Muhammad Ali was born on 1st of March, 1942 in the Beshgul village, Buz district, Andijan region of Uzbekistan. He graduated from the Gorki Institute of Literature (Moscow) in 1966. Muhammad Ali began writing at the age of fifteen. He published his more 20 poetry collections, dastans, novels and other creative works. Muhammad Ali’s historical novel Sarbadarlar is set in the fourteenth century, at the time of Timur’s youth. He translated Indian epic Ramayana into Uzbek in 1978. He is Uzbek Peoples Writer. He was the former chairman of the Uzbekistan Writers Union. Dr. Shamenaz Bano is the author, co-author and editor of 9 books, Women Poets: Within and Beyond Shore Volume I, II &III,Verses on Racism, Resistance and Refugee Crisis Vol I, Gender Studies: Fragmentation and Formation, Shades of Life, The Celebration of Our Voices, Trends, Issues and Implicationsin Asian Women Writing, and Feeling for You. She is currently teaching English Literature at S. S. Khanna Girls’ Degree College, Allahabad. She has contributed poems to many international poetry magazines andanthologies like Women of Substance, Raven Cage Magazine, Poetry Archive,Women of Reflection, Women of Passion, Poetic Souls, Feeling International, Hope Reborn and Glomag. She is a member of the editorial board of many international journals, including Angloamericanae Journal (Macedonia), KJHSS (Azerbaijan) Anglisticum (Macedonia), IJRHS (Jordan), Cyber Literature: An Online Journal, The Context, English Literator Society, Literary Miscellany, Research Access & Expressions, Levure Litteraire (France-Germany-USA). She regularly contributes articles to Web magazines - Boloji.com, Merinews.com and Globalasia.com. Her blogs are: http://shamenaz.wordpress.com, http://shamenazsheikh.blogspot.in.